Toy Art UK - Artists and Toy Art events from the UK and beyond. Last year we took a leap of faith and we put together Toy Art 2018, and with the amazing support of the artists and the toy art community it was a success! Nobody could be happier than us, but it turns out the artists and companies who came with us on the journey to the first event liked what we did as well – so much so that they are coming back to join us for Toy Art 2019. This time we are able to invite even more artists and toy art focused companies to come and join us and we are back with twice the number of artists and vendors. The venue has changed for 2019 and we are going to be holding Toy Art 2019 in the very heart of Leeds at the Marriott Hotel, while the venue for the first event was perfect for 2018 we needed to grow and we needed to make it easier for visitors to find. Everything we do at Toy Art is about the artists and the art they create, our remit is also to let as many people know about their incredible work as we can. 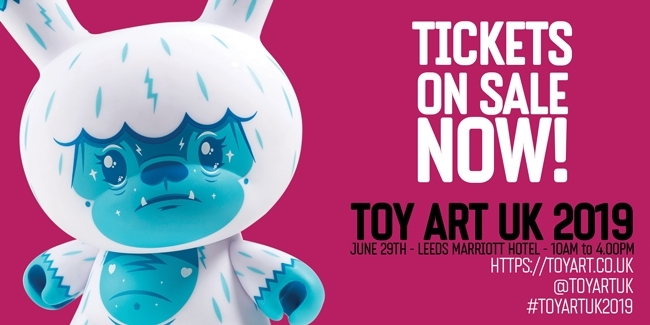 Over the next few month leading up to the event we will be promoting Toy Art 2019 and you can expect to hear from us on social media and in the real world at venues around Leeds. You can always come back to this website for more information and news as we put our plans into place, but the best place to get up to date news and information is always going to be on Facebook https://www.facebook.com/toyartuk/ or on Instagram https://www.instagram.com/toyartuk/ so come and join us there. Artist and vendor announcements are starting in April and tickets for Toy Art 2019 will be available for you to buy very soon. We have contacted all the artist and vendors who came to Toy Art 2018 to get them booked in for Toy Art 2019 – and now its time to open up artist applications for Toy Art 2019 on June 29th – please click HERE or click the graphic above to get to the form and let us know about you and your work. Brand new, unknown or well known and established we want to hear from you, so tell us as much as you can and we will be in touch very soon. Morning all, so the bids and the payments are in for all of the custom pieces we auctioned for Inkwell with our friends over at Forbidden Planet International – and the customs are en route to their new homes today. Once we know they have arrived safely we will update you all with a total raised and organise getting the money over to Inkwell. We can tell you that we are going to be working with Inkwell more and more in the future, and that you can expect to see customs from them and their team of artist in the near future! Again we want to say A HUGE THANK YOU – to everyone involved in this charity fundraising, we really could not be any happier and we are so pleased to be able to do this for a seriouly deserving cause which is close to all of our hearts.